The inspiration for this recipe came from some gorgeous, uber-ripe Bartlett pears I found last week at the farmer’s market. At first thought I would make Kenya some pear puree or just slice them for a snack, but then I remembered I had some canned organic pumpkin at home and wondered if that combination would work. 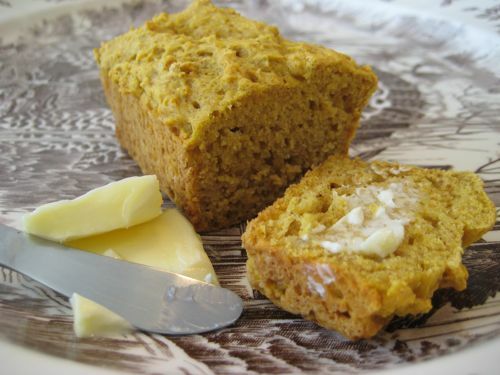 I've never seen pumpkin-pear bread, but it sounded like something yummy to eat in the autumn. The pears were so ripe, all I did was peel and mash them before adding to the recipe. QUICK TIP_ if you don't have ripe pears you could place them next to bananas in a fruit bowl and they will ripen faster. I'm usually not a fan of any type of canned fruit or veggie, but canned pumpkin really is a life saver. It’s really a pain to make pumpkin puree, even when you roast it, the flavors never quite become as rich and sweet as the canned variety. So, this is one of those times that I give into convenience. When Kenya woke up from his nap, the smell of fresh bread was all through the house. After it cooled we sat and tried it with all kinds of yummy spreads like pumpkin butter, apple butter, honey and just plain butter. Mmmm... fall really is here! 2. Cream the butter and agave with a standing or handheld mixer. 3. Add the pumpkin and pear purees. 5. In a separate bowl sift the flour and remaining ingredients. 6. Add the flour mixture to the pumpkin mixture a little at a time until combined. Do not overly mix or beat the mixture. 7. Place in a 6 individual greased loaf pans or in one 9×5 inch greased loaf pan. 8. Bake for 20 minutes for small loaf pans or 1 hour for single loaf. 9. Cool for 10 minutes and then run a knife around the loaf pan to help release on to a cooling rack. *A regular weelicious Mommy made muffins instead of the bread which cooked for 15-20 minutes and replaced maple syrup for the agave. She said they were delicious! Oh, these look YUMMY! I would have never put together pear and pumpkin. I am going to experiment with some baking this weekend and see if I can make this wheat free. Wish me luck! Thanks for yet another WONDERFUL recipe! These mini loaves look delicious! The pumpkin pear combo sounds like it would make a very moist treat! YUM! I love your website! We use it all the time for our 1 1/2 year old! Could I make pumpkin bread without the pear and sub with chocolate chips out of this recipe for a sweet treat? I have a pumpkin cake mold. Can I use that instead of a loaf pan? Also if you don't use the pear puree, should you add more pumpkin?